After Arden On The Severn was founded, an outside company by the name of Beach Shores Inc. operated and maintained the beaches, boat ramps, and public amenities under the name of Sunrise Beach Inc. From 1955 through 1975, they managed to do an ever-increasingly poorer job. January 1973: The Arden Civic Association created a "Beach Buying-Liaison Committee". The committee approached Sunrise Beach Inc. and began a campaign of investigation, financial campaigning and shaping future bylaws while negotiating a beaches purchase price. December 17, 1975: Arden Beaches Inc. was incorporated and the members of the beaches committee became the first ABI Board of Directors. The residents of Arden raised funds through loans and purchase contributions. A total of 420 households contributed to the creation of Arden Beaches Inc. Forty-six loans and 354 contributions were received by the committee with an additional 4 partial payments and 16 pledged (but unpaid) contributions. April 29, 1976: Arden Beaches Inc. (ABI) bought the property from Beach Shores, Inc. for $60,000 and the residents of Arden became the owners of the beaches and boat ramps. August 9, 1976: The first meeting of the ABI shareholders took place and formal elections were held to fill the elected positions of the corporation. Excitement was rampant and the beaches were overrun with residential volunteers who not only removed trash, but also contributed time, work hours, and personal financing to renovating many of the piers, boat ramps, and beach furniture that had not been taken care of. This was the start of the effort that governs the operating principles of ABI. In the spirit of those community-minded people, the organization re-incorporated as a non-profit civic association and has since served to promote and enhance the quality of life for children and families in Arden On The Severn. In 1989 Arden Beaches Inc. voted to establish a user fee and permit identification system (decals) so only residents can park vehicles and launch boats from ABI community property. Fees are are decided based on the requirements of the organization to maintain the standards expected by the users of the community property within Arden. ABI also sponsors a number of social and work-action gatherings to benefit the children and families who live in our extraordinary beach community setting. This unique combination has provided countless summer memories and cultivated many friendships for families and friends at Arden On The Severn. The members of the ABI board are selected from the community and elected to their positions where they determine the focus of ABI for the betterment of the shared assets of the community. The ABI board meets regularly to review both public and private matters concerning the beaches and boat ramps in our community. ABI meets the second Monday of each month — usually at 7:00pm — at the Arden Town Hall located on Omar Drive. ABI conducts its Annual Shareholders meeting in January of each year; the time, date and location are published in the NewsBuoy. 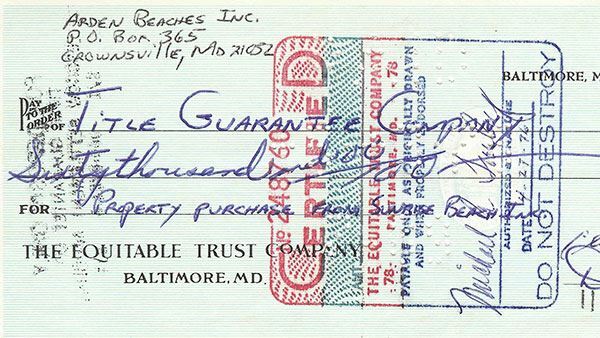 Arden Beaches Inc. buys community beach property in 1976.